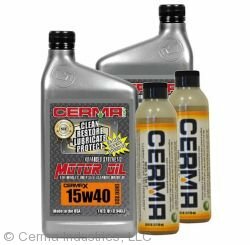 Follow the Cerma protocol with the products in our value package including Cerma Engine Treatment and save money when you purchase one of our Cerma Engine Packages. 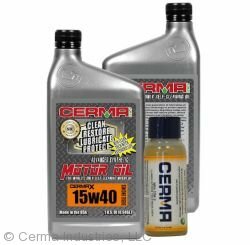 Straight from the start you will see, hear and feel the difference after using Cerma Engine products. 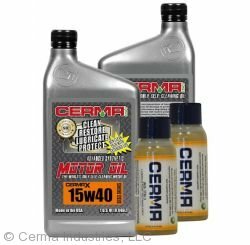 By the time the Cerma process is complete, your engine will be at its peak performance, have that extra horsepower, run quieter and smoother, and start to benefit from longer oil life and protection, and increased fuel economy. 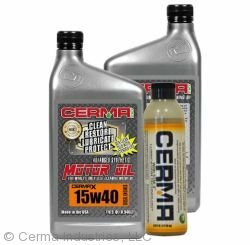 *** NOTE: LARGER DIESEL ENGINES LIKE TRUCKS AND SEMIS REQUIRE USER TO DRIVE A MINIMUM OF 3,000 MILES PRIOR TO OIL CHANGE.